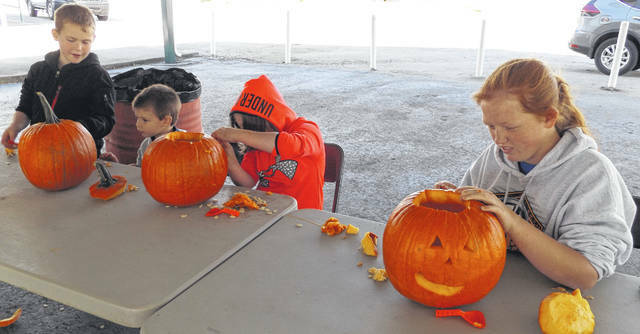 Pumpkins and carving tools were provided children on Saturday at the Fall Camp-Out held at the Clinton County Fairgrounds. From left are Tiegan Rodgers, 9, Brody Woodford, 3, Scarlett Rodgers, 7, and Lacie Sandlin, 14. Project completed! 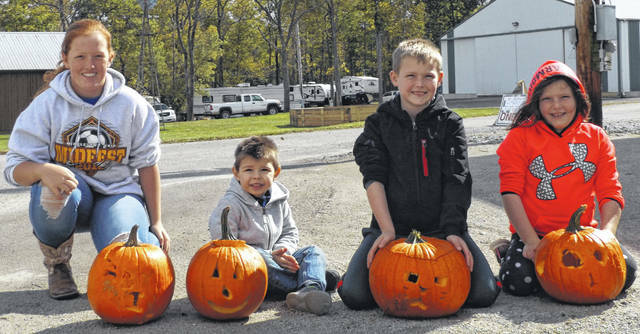 Pumpkins and carving tools were provided children on Saturday at the Fall Camp-Out held at the Clinton County Fairgrounds. From left are Lacie Sandlin, 14 (displaying a personalized back side of her jack-o’-lantern), Brody Woodford, 3, Tiegan Rodgers, 9, and Scarlett Rodgers, 7. Later, the group walked through an elaborate haunted house set up in a fairground building. To reserve camping sites for next year’s Fall Camp-Out, contact the Senior Fair Board at 937-382-4443.